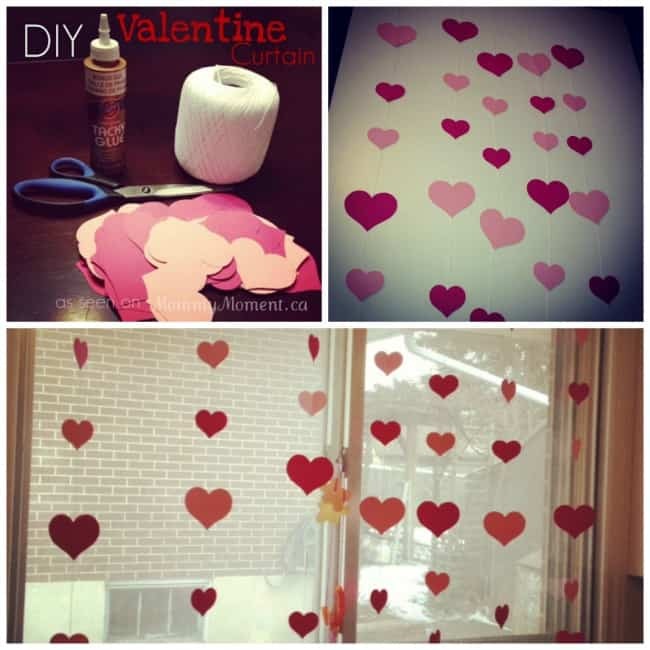 Today’s project is a super cute paper heart curtain that is perfect for Valentine’s Day decor. Yarn, string or ribbon. I used crochet yarn. 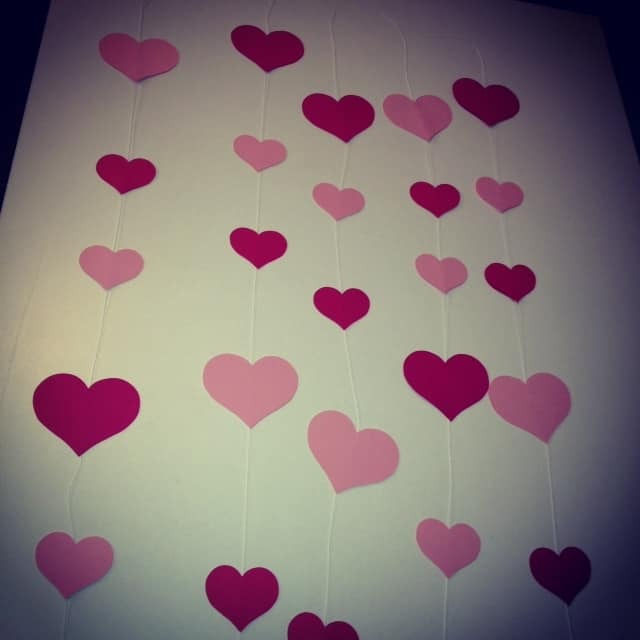 I used my handy-dandy cricut to cut out 2 inch and 3 inch hearts in a reddish color and a light pink. If you don’t have a cricut you could certainly cut out hearts by hand but it would be quite tedious. Basically all you do is measure how long you want your curtain to be. I decided to put mine in our kitchen window because there isn’t anything on it at the moment. Once you have all of your yarn or ribbon cut, lay them out on the table or floor and start gluing the hearts on. Put one heart on the front, and one on the back of your yarn. It takes a lot more hearts to do it this way but looks MUCH better than just one with the string showing on the back. You can do whatever pattern you want for your curtain. I did a 3 inch heart at the top, then two 2 inch hearts and then repeated that pattern twice. Make sure you leave a couple of inches of yarn at the top so you can tie it. 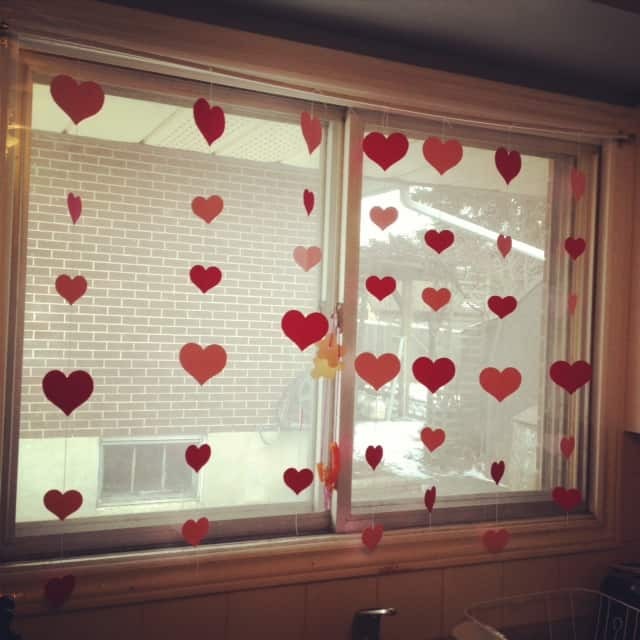 I really love how this heart curtain turned out. It adds a cute little splash of color to my kitchen but you could hang these anywhere! 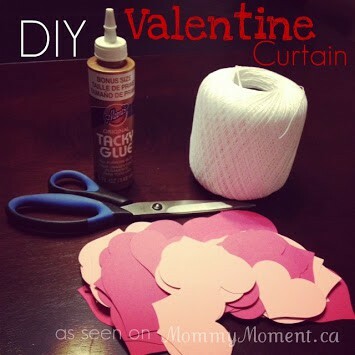 Are you going to make this easy peasy Valentines Day curtain for your home? I would love to hear all about it! Jennifer Hunt is the owner/licensee of Guelph Mompreneurs, the creative mind behind Imagine With Paper, and a social media footprint in the Guelph-Wellington area with her blog My Big Blue World which is focused on the adventures – and misadventures – of being a mom of 3 boys. She describes herself as a “serial crafter and DIY addict” and sometimes finds it hard to step away from pinterest. Although life can get pretty hectic she has decided to add a new blog “Goddess With a Gluegun” into the mix. So cute! I love the idea! 🙂 Thanks for sharing. That is so cute! I pinned it so I can try to make it with my kids, I think they’d have a lot of fun making and hanging it. Those are adorable, you are so creative! Such a cute idea! My daughter would love these “curtains” in our windows! It is super easy! and I must say, my cricut and I are best buddies! Such a simple & pretty idea! Definitely doing this one with the kids!